Born in 1849, Davie Strath, with Andrew and George, was one of three St Andrews golfing brothers. Like Andrew, Davie was to die young from tuberculosis. He was a good friend of another golfer to die before his time, Young Tom Morris, and the two were keen rivals in their St Andrews days. They played a £100 a side match over the Old Course in 1873, Strath winning by two holes. This led to a series of three more matches, two of them over six rounds, and, although Morris won the contest by two matches to one, they were well matched as their aggregate scores in the two six round matches were the same. 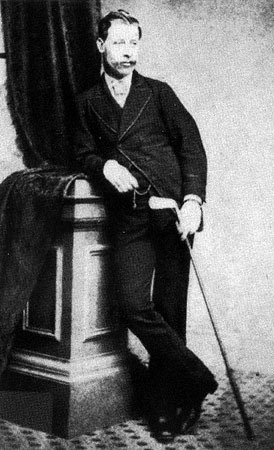 Young Tom had the edge on him in the Open Championship, though, Strath finishing second to Tom in 1870 and 1872. In 1876 he moved to become keeper of the green in North Berwick where he remained for two years. That same year he tied for the Open Championship but after farcical organisation by the R&A, and its refusal to make a decision on the rules in advance of a play-off, he refused to take part and the Champion Golfer of that year was Bob Martin in a walkover. Tuberculosis struck him down in 1878 and although well enough to win the Glasgow tournament at Alexandra Park that March, a doctor recommended a visit to Australia where the climate might offer a cure. Consequently he sailed south in the autumn and all was well until December when he developed a cold as the ship got among icebergs. On arriving in Melbourne he was taken to the house of a family friend in Carlton, ironically next to the home of Professor Halford, a former St Andrews student and founder of Melbourne University’s medical school, where he died on 24th January 1879 and was buried in Melbourne General Cemetery. A headstone was funded by the St Andrews Golf Club and the Golf Society of Australia and erected in 2006 with a multitude of reports that the “mystery” of Davie Strath had been solved which in itself is rather mysterious as his death in Melbourne was reported in the Scotsman in March 1879 and reprinted by several other Scottish newspapers.